In these turbulent times, many have taken up the very real notion that one should be prepared for anything that may come. Survival prepping has taken off! Some install expensive bunkers, invest in high tech security systems and a myriad of other protections. 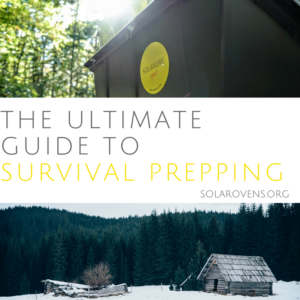 All of the these are relevant, but truly, survival preparation does not have to go that far. Here lies an in-depth prepper’s guide- by the end of which you will know exactly what to do to start your survival prepping journey. As with anything in life, knowledge is the key. This is where you need to take in all the information you can in order to avoid pitfalls and learn from the mistakes of others. Getting into survival prepping can seem like a lot to tackle all at once–so let’s break it down into something more manageable by looking at your basic survival kit. A survival kit is as basic as it gets when it comes to survival prepping. This kit includes only the items you would need in dire survival situations. This kit is not about comfort–it’s about staying alive. At least 1 gallon of water per person, per day (ideally, 2 gallons per person per day). For more on water collection and storage methods, click here. Pocket Knife, preferably a Swiss-Army type one with pliers, knife, can opener, etc. Matches and striker sealed in waterproof container; Fire starters such as Vaseline dipped cotton balls, toilet paper tubes with lint, etc. 2 changes of weather-appropriate clothing per person, including underwear and socks. Your “docs box” with your important documents. For more on this, see our article here. The above list is an excellent way to begin your survival prepping journey. When first getting into prepping it seems like a daunting task, but a short list of the basics can make all the difference. There are a lot of pitfalls you’ll want to steer clear of when survival prepping. Sometimes common sense can be misleading–because there is nothing “common” about survival situations. Books are less common these days because we do so much reading on the Internet and Kindles. But if the power goes out, having a good collection of survival books could save your life. They’ll give you something to read when you’re bored, and will have important instructions on things like purifying water, building fires, and medical care. 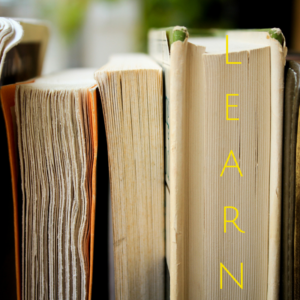 While you want to learn as much of this info as you can ahead of time, no one can know everything, and there are bound to be times when a survival library will come in handy. The importance of water can not be overemphasized. 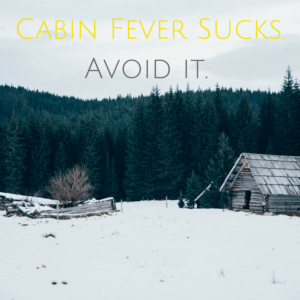 There are many survivalists who have six months of food and only two weeks of water on hand. Considering that you can survive without food about ten times as long as you can survive without water, you’d be better off with two weeks of food and six months of water. Don’t do that either, but at least make sure your water will last as long as your food. If you don’t have enough room for that much, there are many ways to collect and purify water. Too many new survival preppers buy nothing but rice, beans, flour, salt and sugar. If that’s all you have to eat after a disaster, you’re going to be miserable. Your body will have trouble adjusting to the new bare-bones diet and you’ll suffer from food fatigue, where your survival food won’t be appetizing even when you’re very hungry. Make sure you buy the ingredients for a variety of possible meals so you’ll feel satisfied every time you eat. While the last few points have been about food, don’t forget all your other survival needs. When a lot of people think of prepping, the first things they think about are food and water and they proceed to stock up on them while neglecting health and beauty supplies, first aid kits, bug out bags, cooking implements, clothes, weapons and other important items. While food should be your first priority, don’t forget your other priorities. 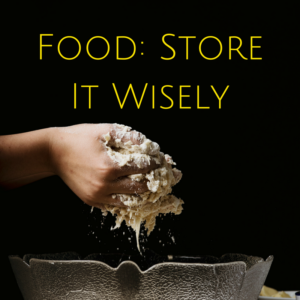 While food storage should not be your only priority, it should definitely be high on the list. Power can be spotty in a survival situation, so obviously dry food storage is highly preferred to anything that requires refrigeration. milk, condensed milk, and canned coconut milk. Coconut milk will help you cook rice faster! Stewed tomatoes, and vegetable, beef or chicken stock can also help you cook rice without depleting your drinking water. It’s also a great excuse to stock up on canned beer, which you can use to cook! Milk is a versatile food well worth stockpiling if you don’t have a cow or a goat. Bob’s Red Mill dehydrated milk lasts up to two years, and is an excellent natural creamer for coffee. Skip the non-dairy creamers made of hydrogenated oils and use powdered milk instead. Wax prevents cheese from growing mold and bacteria, and it also keeps moisture in your cheese so it can store for a very long time without refrigeration. Parmesan is a hard cheese, and in the powder form has a four month expiration date, but encased in wax it can last up to 25 years. Consider buying cheese wax and even a basic hard cheese kit to make your own delicious cheeses. Wax will keep hard cheeses moist during the aging process, and also prevent unwanted mold growth on your aging cheeses. Eggs generally can last a long time and don’t need to be refrigerated, however having egg powders on hand is peace of mind that it for sure will not go bad. Whey contains a high quality complete protein containing all of the essential amino acids required by the body for strength and muscle development. It is a great way of increasing protein intake without adding excessive carbohydrates and fat. Food bars are compact nutrition and should be part of your everyday food storage. Sure, some food bars are a sort of cross between chocolate candy bars and vitamins, others more of a granola, but they are often high in protein. Food bars can provide a satisfaction for a morning meal or an addition to your other rations. Look for coconut bars too! Another food bar that often goes under the radar with Prepper’s (but shouldn’t) is Pemmican, which contains complete protein and gives energy. Free of isolates, fructose, sugar and cholesterol, Pemmican is a concentrated food bar that offers quick energy. Canned & dehydrated meats, poultry and seafood. Meats are important to a balanced diet. When canned and dehydrated, meats have an exceptional shelf life. Adding meats to a meal can also be more of a treat, and help keep spirits up in high intensity survival situations where the finer things in life have all but disappeared. A favorite of American pioneers, oatmeal is a prepper food that’s low in saturated fat, and it’s also a good source of fiber, which is especially important during survival times. Be advised, this food does require higher amounts of water to prepare–as making porridge requires 4 cups of water for every one cup of oatmeal. Soup is good food and can provide a hearty meal with crackers. For shelf-stable and ready to eat meals, think about how you can add canned meat to boxed meals. Cheeseburger Macaroni for example. In uncertain times, you can also take comfort in having several shelf-stable, ready to eat meals on hand, which require no cooking. They are the grocery store version of Meals Ready to Eat. cooking time which could deplete your cooking resources. It also doesn’t store as well. Consider instant rice for this reason alone, though it’s not as healthy as other rice options. 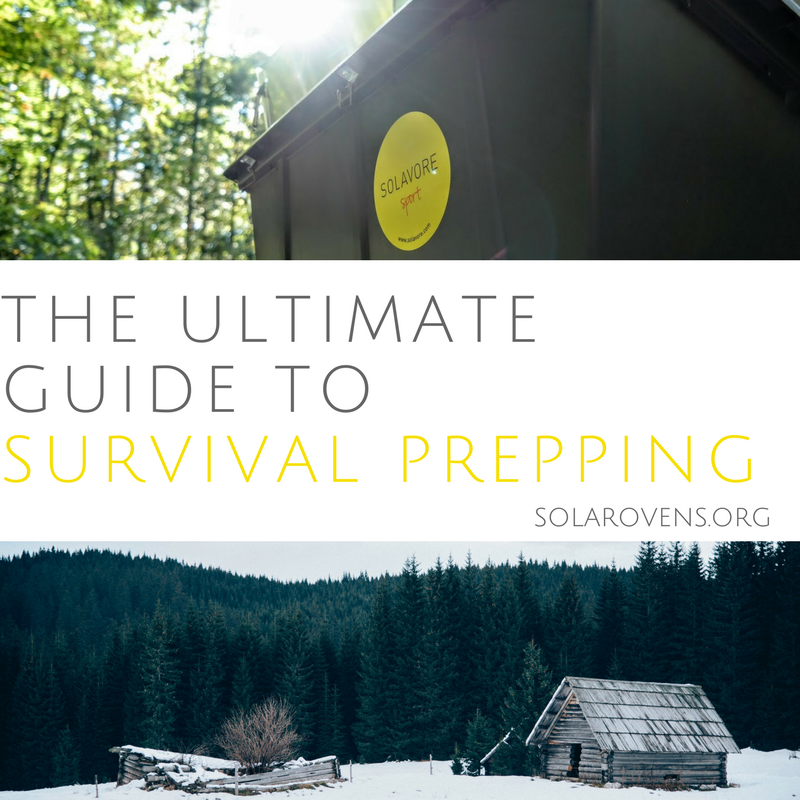 Survival food preparation: go solar and save headaches. Keep the food preparation aspect in mind as well because you don’t want to be stuck with lots of food but no way to consume it. Powerless cooking: Not having to fire up a generator for every hot meal goes along way in terms of resources and peace of mind. With the Solavore Sport you will have all the cooking potential you need as long as you have access to the outdoors and sunlight. Clean drinking water: There is no guarantee you’ll have clean drinking water in survival situations. 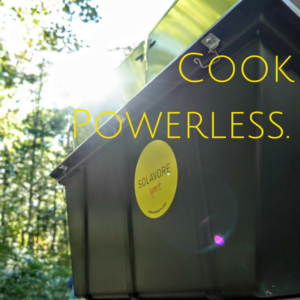 The Solavore Sport has the capability of pasteurizing water, which means you can gather water from whatever means necessary, and ensure it’s safe to drink using the solar oven. Tamperproof cooking: A traditional grill or outdoor cooker is easy for animals to tamper with, destroy and steal your food. The Sport is tamper proof from animals and completely sealed when cooking. If you are survival prepping, you may feel inclined to purchase a gas or electric stove for your food preparation, but keep in mind you may not always have access to fossil fuels to cook with in survival situations. Electric stoves are good, but will require a generator to operate–which brings you right back to the iron grip of fossil fuels. The Solavore Sport will aid you in making sure you at least have a fall back plan in low-resource situations. Here are some recipes that you can use while cooking in your solar oven. 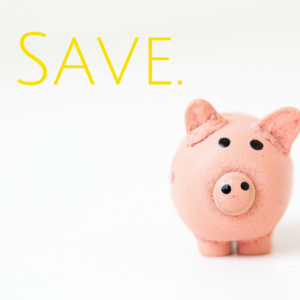 Being prepared for the worst case scenario doesn’t have to break the budget. Purchasing as you go is a very powerful tool, and you would be surprised what you can accumulate little by little. Survivalist101.com helps us out here with an itemized list of how you can get started with survival prepping on a dime. Creating a food stockpile is more easily achieved when you purchase items that you would normally eat so that you can consume what you need now and store the excess. How much excess food you buy will depend on your budget, but you should shoot for buying two extra of every item you expect to consume now. For example, if you need one bag of rice for this week, try buying two for storage. That would give you nearly a one month supply of rice. Buying items on sale, using coupons and sticking with store brands will help you save money that can be applied to extra purchases. Water is no less important than food when prepping on a budget, but it should cost you far less to accumulate a good supply. Each month you should shoot for buying three or four gallons of drinking water and a case of bottled water. The cheapest source of gallon jugs are the water dispensing vending machines you see at grocery stores. A secondary source can be used soft drink containers filled with tap water. If you ever spent a night through a power outage, you know how important it is to have a light source. Your first priority is accumulating a supply of quality LED flashlights. Bulbs and batteries last much longer with LED. For every flashlight you buy, pick up several packs of alkaline batteries. At some point add to this a lantern style flashlight that can light a whole room. Begin to accumulate votive candles from discount stores and a large supply of matches. Keep up to date with your prescriptions and, if you are able, ask your doctor for an extra 30-day supply. Invest in a good first aid kit and begin to accumulate additional supplies of band-aids, aspirin, antibiotic ointments, cold medicines and diarrhea medicine. You will need sanitation and hygiene items, so when buying disinfectants, cleansers for clothes, deodorant, shampoo, razor blades, etc., add one or two extra just as you do with your food items. This is a great time to bust out those old workout videos and give your body a little love. Setting up a small workout area can also work well into this. A workout station with hand weights, a medicine ball or two, and some elastic bands can help take your mind off things. Your sense of smell is a direct line into your brain stimulation–for example the delicious smell of barbecue can instantly make you hungry and excited. Using a diffuser to bring good smells into your space can help relax you and ease the nerves. Additionally, If you have some colorful drapes or other decor accents to add this would be a good time to pull those out. In survival prepping you don’t get a ton of extras, but any good prepper will tell you that having feel good items on hand is an absolute must. A good cheeseburger cooked in your Solavore Sport can really curb the tension and bring back memories of comfortable times. This is by no means the end all be all survival prepping guide, but it will absolutely get you going in the right direction. Sustaining your life in a survival situation takes skill, knowledge and the right attitude. There is no way to sum up the vast information that entails in one piece of content. If you want to be truly informed don’t stop here. Continue learning so you can practice effective survival prepping–your life may depend on it.